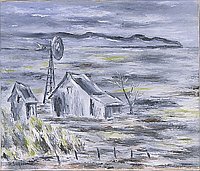 Desolate grayish winter landscape features a house with a windmill and outhouse to the left. In the background, the black outline of a train is visible on the horizon, heading right as a long black plume of smoke trails behind it. In the foreground, bare poles of a fence and a small mound of grass on the left. 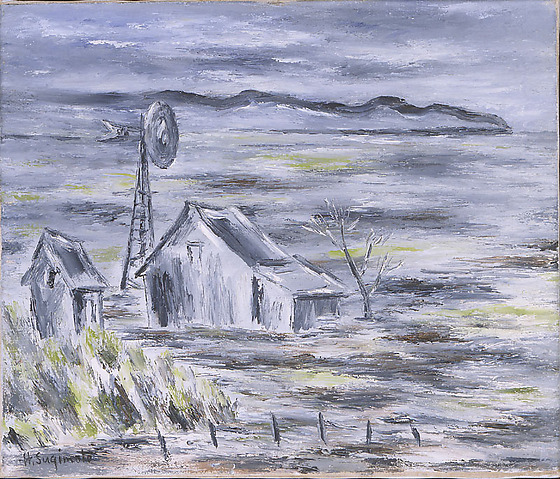 Signed in medium, bottom left corner: H. Sugimoto Written on back, left: "On the Way to Jerome Camp"